Data General and TI's small computers were not very successful, but observers expected AT&T to soon enter the computer industry, and other large companies such as Exxon, Montgomery Ward, Pentel, and Sony were designing their own microcomputers. Whether IBM had waited too long to enter an industry in which Apple and others were already successful was unclear. An observer stated that "IBM bringing out a personal computer would be like teaching an elephant to tap dance." Successful microcomputer company Vector Graphic's fiscal 1980 revenue was $12 million. A single IBM computer in the early 1960s cost as much as $9 million, occupied one quarter acre of air-conditioned space, and had a staff of 60 people; in 1980 its least-expensive computer, the 5120, still cost about $13,500. The "Colossus of Armonk" only sold through its internal sales force, had no experience with resellers or retail stores, and did not introduce the first product designed to work with non-IBM equipment until 1980. After developing it in 12 months—faster than any other hardware product in company history—IBM announced the Personal Computer on 12 August 1981. Pricing started at US$1,565 (equivalent to $4,213 in 2017) for a configuration with 16K RAM, Color Graphics Adapter, and no disk drives. The company intentionally set prices for it and other configurations that were comparable to those of Apple and other rivals; what Dan Bricklin described as "pretty competitive" pricing surprised him and other Software Arts employees. One analyst stated that IBM "has taken the gloves off", while the company said "we suggest [the PC's price] invites comparison". Microsoft, Personal Software, and Peachtree Software were among the developers of nine launch titles, including EasyWriter and VisiCalc. In addition to the existing corporate sales force IBM opened its own Product Center retail stores. After studying Apple's successful distribution network, the company for the first time sold through others, ComputerLand and Sears Roebuck. Because retail stores receive revenue from repairing computers and providing warranty service, IBM broke a 70-year tradition by permitting and training non-IBM service personnel to fix the PC. Most other personal-computer companies did not disclose technical details; TI, for example, intentionally made developing third-party TI 99/4A software difficult, even requiring a lockout chip in cartridges. IBM itself kept its mainframe technology so secret that rivals were indicted for industrial espionage. For the PC, however, IBM immediately released detailed information. The US$36 IBM PC Technical Reference Manual included complete circuit schematics, commented ROM BIOS source code, and other engineering and programming information for all of IBM's PC-related hardware, plus instructions on designing third-party peripherals. It was so comprehensive that one reviewer suggested that the manual could serve as a university textbook, and so clear that a developer claimed that he could design an expansion card without seeing the physical computer. Rivals such as Apple, Tandy, and Commodore—together with more than 50% of the personal-computer market—had many advantages. While IBM began with one microcomputer, little available hardware or software, and a couple of hundred dealers, Radio Shack had 14 million customers and 8,000 stores—more than McDonald's—that only sold its broad range of computers and accessories. Apple had five times as many dealers in the US as IBM, an established international distribution network, and an installed base of more than 250,000 customers. Hundreds of independent developers produced software and peripherals for both companies' computers; at least ten Apple databases and ten word processors were available, while the PC had no databases and one word processor. The computer had very limited graphics capability, and customers who wanted both color and high-quality text had to purchase two graphics cards and two monitors. Steve Jobs at Apple ordered a team to examine an IBM PC. After finding it unimpressive—Chris Espinosa called the computer "a half-assed, hackneyed attempt"—the company confidently purchased a full-page advertisement in The Wall Street Journal with the headline "Welcome, IBM. Seriously". Microsoft head Bill Gates was at Apple headquarters the day of IBM's announcement and later said "They didn't seem to care. It took them a full year to realize what had happened". The IBM PC was immediately successful. The PC was small, light weight, and easy to use. Because it was advertised as a personal computer for anyone and not just large corporations, and because it was small and could fit easily into people's home, it became a device of popular choice for many people. It couldn't be helped that IBM also advertised it with the lovable Charlie Chaplin's tramp character, who after seeing the computer, falls in love with it and purchases the PC. Chaplin's character became the face of the company's PC. BYTE reported a rumor that more than 40,000 were ordered on the day of the announcement; John Dvorak recalled that one dealer that day praised the computer as an "incredible winner, and IBM knows how to treat us — none of the Apple arrogance". One dealer received 22 $1,000 deposits from customers although he could not promise a delivery date. The company could have sold its entire projected first-year production to employees, and IBM customers that were reluctant to purchase Apples were glad to buy microcomputers from its traditional supplier. The computer began shipping in October, ahead of schedule; by then some referred to it simply as the "PC". The original PC's maximum memory using IBM parts was 256 kB, achievable through the installation of 64 kB on the motherboard and three 64 kB expansion cards. The processor was an Intel 8088 running at 4.77 MHz, 4/3 the standard NTSC color burst frequency of 315/88 = 3.57954[lower-alpha 1] MHz. (In early units, the Intel 8088 used was a 1978 version, later were 1978/81/2 versions of the Intel chip; second-sourced AMDs were used after 1983). Some owners replaced the 8088 with an NEC V20 for a slight increase in processing speed and support for real mode 80186 instructions. The V20 gained its speed increase through the use of a hardware multiplier which the 8088 lacked. An Intel 8087 coprocessor could also be added for hardware floating-point arithmetic. Although the TV-compatible video board, cassette port and Federal Communications Commission Class B certification were all aimed at making it a home computer, the original PC proved too expensive for the home market. At introduction, a PC with 64 kB of RAM and a single 5.25-inch floppy drive and monitor sold for US $3,005 (equivalent to $8,089 in 2017), while the cheapest configuration (US $1,565) that had no floppy drives, only 16 kB RAM, and no monitor (again, under the expectation that users would connect their existing TV sets and cassette recorders) proved too unattractive and low-spec, even for its time (cf. footnotes to the above IBM PC range table). 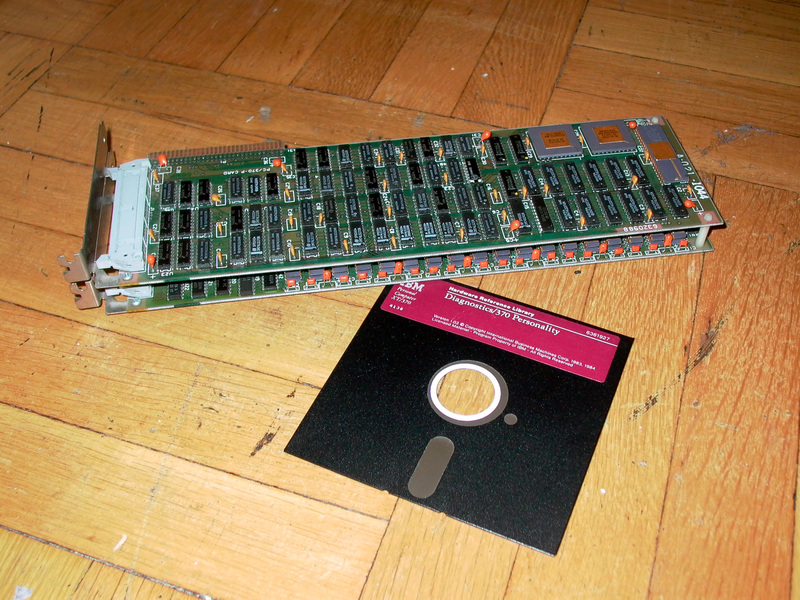 While the 5150 did not become a top selling home computer, its floppy-based configuration became an unexpectedly large success with businesses. The main circuit board in an PC is called the motherboard (IBM terminology calls it a planar). This mainly carries the CPU and RAM, and it has a bus with slots for expansion cards. On the motherboard are also the ROM subsystem, DMA and IRQ controllers, coprocessor socket, sound (PC speaker, tone generation) circuitry, and keyboard interface. The original PC also has a cassette interface. In a special 1984 issue dedicated to the IBM PC, BYTE concluded that the PC had succeeded both because of its features like an 80-column screen, open architecture, and high-quality keyboard, and "the failure of other major companies to provide these same fundamental features earlier. In retrospect, it seems IBM stepped into a void that remained, paradoxically, at the center of a crowded market". ↑ Inventions That Built the Information Technology Revolution by Rhys McCarney "IBM CEO John Opel decided to use an open architecture"
↑ Michael J. Miller (August 8, 2011). "Why the IBM PC Had an Open Architecture". pcmag.com. "In some ways, the most far-reaching decision made by the team that built the IBM PC was to use an open architecture, rather than one that was proprietary to IBM. That decision led to the market for add-in boards, for large numbers of third party applications, and eventually to a large number of competitors all creating "IBM-compatible" machines. [...] Bill Lowe went to IBM's Corporate Management Committee in July 1980 to propose the project"
1 2 Salmans, Sandra (1982-01-09). "Dominance Ended, I.B.M. Fights Back". The New York Times. Retrieved 2 January 2015. ↑ Morgan, Christopher P (March 1980). "Hewlett-Packard's New Personal Computer". BYTE. p. 60. Retrieved 18 October 2013. 1 2 3 4 5 6 7 8 9 10 Burton, Kathleen (February 1983). "Anatomy of a Colossus, Part II". PC Magazine. p. 316. Retrieved 21 October 2013. 1 2 3 4 5 Swaine, Michael (1981-10-05). "Tom Swift Meets the Big Boys: Small Firms Beware". InfoWorld. p. 45. Retrieved 1 January 2015. 1 2 3 4 Gens, Frank; Christiansen, Chris (November 1983). "Could 1,000,000 IBM PC Users Be Wrong?". BYTE. p. 135. Retrieved 19 March 2016. ↑ "I.B.M. 'S Speedy Redirection". The New York Times. 1983-11-02. Retrieved 2011-02-25. ↑ "Interest Group for Possible IBM Computer". BYTE. January 1981. p. 313. Retrieved 18 October 2013. ↑ Libes, Sol (June 1981). "IBM and Matsushita to Join Forces?". BYTE. p. 208. Retrieved 18 October 2013. 1 2 3 4 Morgan, Chris (July 1981). "IBM's Personal Computer". BYTE. p. 6. Retrieved 18 October 2013. ↑ Markoff, John (1981-10-05). "Newcomers Join Rush to Enter Personal Computing". InfoWorld. pp. 46–47. Retrieved 2 January 2015. 1 2 3 4 5 6 7 8 Libes, Sol (December 1981). "Bytelines". BYTE. pp. 314–318. Retrieved 29 January 2015. 1 2 3 4 5 Blaxill, Mark; Eckardt, Ralph (2009). The Invisible Edge: Taking Your Strategy to the Next Level Using Intellectual Property. Penguin Group. pp. 195–198. ISBN 9781591842378. 1 2 3 4 5 6 7 "The birth of the IBM PC". IBM Archives. Retrieved 13 June 2014. ↑ "IBM 5120". IBM. Retrieved 20 March 2016. 1 2 3 4 5 6 7 Wise, Deborah (1982-08-23). "The colossus runs, not plods— how the IBM PC came to be". InfoWorld. p. 13. Retrieved 29 January 2015. 1 2 3 4 5 6 7 8 9 10 11 12 Sandler, Corey (November 1984). "IBM: Colossus of Armonk". Creative Computing. p. 298. Retrieved February 26, 2013. 1 2 3 4 5 6 7 8 9 10 McMullen, Barbara E.; John F. (1984-02-21). "Apple Charts The Course For IBM". PC Magazine. p. 122. Retrieved 24 October 2013. 1 2 3 4 5 6 7 8 9 Hormby, Tom (2006-08-12). "Origin of the IBM PC". Low End Mac. Retrieved 10 January 2015. 1 2 3 4 Seidner, Rich (speaker); Cringely, Robert X. (June 1996). "Part II". Triumph of the Nerds: The Rise of Accidental Empires. Season 1. PBS. 1 2 3 4 5 6 7 Morgan, Chris (January 1982). "Of IBM, Operating Systems, and Rosetta Stones". BYTE. p. 6. Retrieved 19 October 2013. 1 2 Bunnell, David (Feb–Mar 1982). "The Man Behind The Machine? / A PC Exclusive Interview With Software Guru Bill Gates". PC Magazine. p. 16. Retrieved February 17, 2012. 1 2 3 Camenker, Brian (Nov 1983). "The Making of the IBM PC". BYTE. pp. 254, 256. Retrieved 19 March 2016. 1 2 Edlin, Jim (February–March 1982). "Confessions of a Convert". PC Magazine. p. 12. Retrieved 20 October 2013. 1 2 Rawsthorn, Alice (2011-07-31). "The Clunky PC That Started It All". The New York Times. Retrieved 21 October 2013. 1 2 3 4 5 6 7 8 Zussman, John Unger (1982-08-23). "Let's keep those systems open". InfoWorld. p. 29. Retrieved 29 January 2015. 1 2 3 "IBM Archives". Archived from the original on 2003-02-10. ↑ Friedl, Paul J. (November 1983). "SCAMP: The Missing Link In The PC's Past?". PC. pp. 190–197. Retrieved 8 January 2015. 1 2 3 4 5 Atkinson, P, (2013) DELETE: A Design History of Computer Vapourware, London: Bloomsbury Publishing. ↑ "Obsolete Technology Website". Retrieved 2008-08-14. ↑ "Welcome, IBM, to personal computing". BYTE. December 1975. p. 90. Retrieved 19 March 2016. 1 2 3 4 "PCommuniques". PC Magazine. February–March 1982. p. 5. Retrieved 20 October 2013. ↑ Likewise, IBM's early PC video display monitors have similar numbers: The IBM Monochrome Display (IBM's MDA monitor) is machine type 5151, the IBM Color Display (their CGA monitor) is machine type 5153, and the IBM Enhanced Color Display (their EGA monitor)) is machine type 5154. 1 2 3 4 5 6 7 8 9 10 Scott, Greg (October 1988). ""Blue Magic": A Review". U-M Computing News. 3 (19): 12–15. ↑ Hey, Tony; Papay, Gyuri (2014). The Computing Universe: A Journey through a Revolution. Cambridge University Press. p. 153. ISBN 9780521766456. ↑ Rhines, Walden C. (2017-06-22). "The Inside Story of Texas Instruments' Biggest Blunder: The TMS9900 Microprocessor". IEEE Spectrum. Retrieved 2017-07-08. ↑ Musil, Steven (2013-10-28). "William Lowe, the 'father of the IBM PC,' dies at 72". CNet. Retrieved 8 January 2015. 1 2 3 4 Porter, Martin (November 1983). "The Talk of Boca". PC Magazine. p. 162. Retrieved 22 October 2013. 1 2 3 4 Elder, Tait (July 1989). "New Ventures: Lessons from Xerox and IBM". Harvard Business Review. Retrieved 20 January 2015. 1 2 3 4 5 6 7 8 Sanger, David E. (1985-08-05). "Philip Estridge Dies in Jet Crash; Guided IBM Personal Computer". The New York Times. Retrieved 19 October 2013. 1 2 Porter, Martin (1984-09-18). "Ostracized PC1 Designer Still Ruminates 'Why?'". PC Magazine. p. 33. Retrieved 25 October 2013. ↑ Maher, Jeannette A. (May–June 1982). "Boca Boo-Boo". PC Magazine. p. 10. Retrieved 21 October 2013. 1 2 3 4 5 6 Bradley, David J. (September 1990). "The Creation of the IBM PC". BYTE. pp. 414–420. Retrieved 2 April 2016. ↑ McCoy, Frank (2000-01-03). "Mark Dean / He refined the desktop PC. Now he wants to kill it". US News and World Report. Archived from the original on 2012-10-20. Retrieved 6 January 2015. 1 2 3 4 5 6 7 Bunnell, David (April–May 1982). "Boca Diary". PC Magazine. p. 22. Retrieved 21 October 2013. ↑ Cringely, Robert X. (1996). Accidental Empires. HarperCollins. p. 121. ISBN 0887308554. 1 2 3 4 5 Sanger, David E. (1984-04-22). "The Heady World of I.B.M. Suppliers". The New York Times. ISSN 0362-4331. Retrieved 2017-07-02. 1 2 ″28th Annual Design Review″, I.D. Magazine, Designers' Choice: IBM Personal Computer, Tom Hardy: Industrial Designer,1982. 1 2 3 Bricklin, Dan. "IBM PC Announcement 1981". Dan Bricklin's Web Site. Retrieved 2018-03-06. ↑ Magid, Lawrence J. (2001-08-09). "The Start of a Love-Hate Affair With a Computer". Los Angeles Times. Retrieved 10 January 2015. ↑ Rosenberg, Ronald (1984-04-24). "The Secret World of IBM". The Boston Globe. ↑ Bricklin, Dan. "Notes About the IBM PC Announcement 1981". Dan Bricklin's Web Site. Retrieved 2018-03-06. ↑ Maher, Jimmy (2013-07-18). "The Unmaking and Remaking of Sierra On-Line". The Digital Antiquarian. Retrieved 5 February 2015. 1 2 3 "Presenting the IBM of Personal Computers". PC Magazine (Advertisement). February–March 1982. pp. Inside front cover. Retrieved 20 October 2013. 1 2 3 4 5 6 7 8 9 10 Lemmons, Phil (October 1981). "The IBM Personal Computer / First Impressions". BYTE. p. 36. Retrieved 19 October 2013. 1 2 3 "IBM Introduces Its New Personal Computer Line". Santa Cruz Sentinel. Associated Press. 1981-08-13. p. 41. Retrieved 6 October 2015. 1 2 3 4 5 Williams, Gregg (January 1982). "A Closer Look at the IBM Personal Computer". BYTE. p. 36. Retrieved 19 October 2013. ↑ "My own IBM computer. Imagine that". BYTE (Advertisement). January 1982. p. 61. Retrieved 19 October 2013. ↑ Cook, Karen (1984-04-03). "Now Pitching for IBM...Billy Martin?". PC Magazine. p. 34. Retrieved 24 October 2013. 1 2 3 Porter, Martin (July 1983). "That's Why The PC Is A Tramp". PC Magazine. p. 328. Retrieved 21 October 2013. 1 2 3 Papson, Stephen (April 1990). "The IBM tramp". Jump Cut: A Review of Contemporary Media (35): 66–72. 1 2 Caputi, Jane (1994). "IBM's Charlie Chaplin: A Case Study". In Maasik, Sonia; Solomon, Jack. Signs of Life in the U.S.A.: Readings on Popular Culture for Writers. Boston: Bedford Books. pp. 117–121. ↑ "Right away, you can see a difference". BYTE (Advertisement). August 1982. pp. 206–207. Retrieved 19 October 2013. ↑ "New From CompuSoft / Learning IBM BASIC For the Personal Computer". PC Magazine (Advertisement). November 1982. p. 66. Retrieved 21 October 2013. ↑ "NEC's New Advanced Personal Computer Gives Charlie the Blues". Computerworld (Advertisement). 1982-08-30. p. 81. Retrieved 21 October 2013. ↑ "Media Magician". PC Magazine (Advertisement). February 1983. p. 372. Retrieved 21 October 2013. ↑ Cook, Karen (1984-03-06). "Lampoon Does IBM Double Take, Turns Little Tramp to Great Dictator". PC Magazine. p. 43. Retrieved 24 October 2013. ↑ Dickinson, John (1984-09-18). "IBM's Displaywriter Begets a Family of PC Software". PC. p. 238. Retrieved 29 January 2015. ↑ Bunnell, David (Feb–Mar 1982). "The Man Behind The Machine?". PC Magazine (interview). p. 16. Retrieved February 17, 2012. ↑ Green, Wayne (August 1980). "Publisher's Remarks". Kilobaud. p. 8. Retrieved 23 June 2014. 1 2 Pournelle, Jerry (July 1982). "Computers for Humanity". BYTE. p. 396. Retrieved 19 October 2013. ↑ McEntire, Norman (June–July 1982). "The Key to the PC". PC Magazine. pp. 139–140. Retrieved 21 October 2013. ↑ "Because we put what you want into it, you get what you want out of it". BYTE (advertisement). December 1981. pp. 20–21. Retrieved 12 August 2015. ↑ "The best software for the IBM Personal Computer. Could it be yours?". BYTE (Advertisement). September 1982. pp. 116–117. Retrieved 19 October 2013. 1 2 3 Freiberger, Paul (1981-10-05). "Some Confusion at the Heart of IBM Microcomputer / Which Operating System Will Prevail?". InfoWorld. pp. 50–51. Retrieved 1 January 2015. ↑ "IBM directory lists software". Computerworld. 1984-11-12. p. 53. Retrieved 5 January 2015. ↑ "Read Only". PC (Advertisement). 1985-08-20. pp. 151–154. Retrieved 5 January 2015. ↑ Freiberger, Paul; Swaine, Michael (2000). Fire in the Valley: The Making of the Personal Computer. McGraw-Hill Book. p. 348. ISBN 0071358927. ↑ "Billion Dollar Baby". PC. Feb–Mar 1982. p. 5. Retrieved 25 February 2016. ↑ Bunnell, David (1982-02-03). "Flying Upside Down". PC Magazine. p. 10. Retrieved 6 April 2014. ↑ Freiberger, Paul (1981-10-05). "Old-Timers Claim IBM Entry Doesn't Scare Them". InfoWorld. p. 5. Retrieved 1 January 2015. 1 2 Maher, Jimmy (2017-07-31). "The complete history of the IBM PC, part two: The DOS empire strikes". Ars Technica. Retrieved 2017-08-05. 1 2 Rosen Research (1981-11-30). "From the Rosen Electronics Letter / IBM's impact on microcomputer manufacturers". InfoWorld. pp. 86–87. Retrieved 25 January 2015. ↑ Lundell, Allan (1981-08-31). "TRS-80 Outcrop Companies Evolve". InfoWorld. pp. 46–47. Retrieved 15 February 2015. ↑ Fastie, Will (June 1983). "The Graphical PC". PC Magazine. 1 2 Isaacson, Walter (2013). Steve Jobs. Simon and Schuster. p. 135,149. ISBN 1451648545. ↑ Edlin, Jim (February–March 1982). "TecMates / Tecmar unveils a plug-in smorgasbord". PC Magazine. pp. 57–58. Retrieved 20 October 2013. ↑ Markoff, John (1982-08-23). "Competition and innovation mark IBM add-in market". InfoWorld. p. 20. Retrieved 29 January 2015. ↑ "Front cover". PC. December 1983. Retrieved 1 February 2015. ↑ Burton, Kathleen (March 1983). "Anatomy of a Colossus, Part III". PC. p. 467. Retrieved 30 March 2014. ↑ "Analysts say: IBM's PCjr won't disrupt Christmas for competitors". Santa Cruz Sentinel. Associated Press. November 2, 1983. pp. B-5. Retrieved October 6, 2015. ↑ Ahl, David H. (March 1984). "Digital". Creative Computing. pp. 38–41. Retrieved 6 February 2015. ↑ Hayes, Thomas C. (1983-10-24). "Eagle Computer Stays in the Race". The New York Times. Retrieved 10 January 2015. ↑ Pournelle, Jerry (January 1984). "Too Many Leads, or What in *;?!#"*? Goes First?". BYTE. p. 61. Retrieved 20 January 2015. 1 2 Whitmore, Sam (November 1983). "Fermentations". inCider. p. 10. Retrieved 7 January 2015. 1 2 Lemmons, Phil (Fall 1984). "IBM and Its Personal Computers". BYTE. p. 1. Retrieved 18 March 2016. 1 2 Sanger, David E. (1984-11-19). "I.B.M. Entry Unchallenged at Show". The New York Times. ISSN 0362-4331. Retrieved 2017-07-03. ↑ "1983 Apple Keynote: The "1984" Ad Introduction". YouTube. April 1, 2006. Retrieved January 22, 2014. ↑ Libes, Sol (September 1985). "The Top Ten". BYTE. p. 418. Retrieved 27 October 2013. ↑ "IBM Personal Computers At a Glance". BYTE. Fall 1984. pp. 10–26. Retrieved 18 March 2016. ↑ Kennedy, Don (1985-04-16). "PCs Rated Number One". PC Magazine. p. 42. Retrieved 28 October 2013. 1 2 Schrage, Michael (1985-02-17). "IBM Wins Dominance in European Computer Market". Washington Post. ISSN 0190-8286. Retrieved 2018-08-29. 1 2 Jeffery, Brian (1985-09-30). "IBM's high-end micros encroaching on mini territory". Computerworld. pp. SR/20–21. Retrieved 2 January 2015. ↑ Bartimo, Jim (1984-11-05). "Mainframe BUNCH Goes Micro". InfoWorld. pp. 47–50. Retrieved 6 January 2015. ↑ Mace, Scott (1981-10-05). "Where You Can Go to Purchase the New Computers". InfoWorld. p. 49. Retrieved 1 January 2015. ↑ IBM did not offer own brand cassette recorders, but the 5150 had a cassette player jack, and IBM anticipated that entry level home users would connect their own cassette recorders for data storage instead of using the more expensive floppy drives (and use their existing TV sets as monitors); to this end, IBM initially offered the 5150 in a basic configuration without any floppy drives or monitor at the price of $1,565, whereas they offered a system with a monitor and single floppy drive for an initial $3,005. Few if any users however bought IBM 5150 PCs without floppy drives. ↑ "Dual-Head operation on vintage PCs". ↑ "Howard81.co.uk". Archived from the original on 2008-06-27. ↑ The opening sentence of an April 29, 1986 PC Magazine article reads "If you own an IBM PC AT and your hard disk hasn't crashed yet, don't worry – it probably will." highbeam.com & encyclopedia.com (the latter a Chicago Sun-Times article citing the PC Magazine story). IBM recovered, although with mixed comments, as noted in the Sept. 30, 1986 PC Magazine article, "The Two Faces of IBM's 8-MHz AT," pp. 179 - 184. ↑ wustl.edu - ECE306 Lecture 16 Archived 2011-07-24 at the Wayback Machine. ↑ ctv.se - PC KITS-tutorial page (parallel port, joystick port) Archived 2011-07-28 at the Wayback Machine. ↑ IBM (July 1982). Technical Reference: Personal Computer Hardware Reference Library (Revised ed.). IBM Corp. pp. 2–93. 6025008. ↑ Edlin, Jim (June–July 1982). "CP/M Arrives". PC Magazine. p. 43. Retrieved 21 October 2013. ↑ "PCommuniques". PC Magazine. February 1983. p. 53. Retrieved 21 October 2013. ↑ McCracken, Harry (27 August 2007). "The Most Collectible PCs of All Time". PCWorld. Retrieved 25 September 2017. ↑ "Can You Do Real Work With the 30-Year-Old IBM 5150? ".